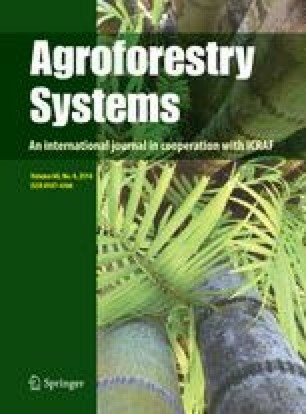 The benefits of tree-based intercropping (TBI) compared to conventional agro-ecosystems in North America could include climate change mitigation and adaptation, although enhancing resilience to climate change through increasing soil diversity remains poorly explored. Diversity of soil microarthropods supports a series of ecological services that may be altered by soil desiccation due to climate change. Here we study the effect of red oak and hybrid poplar TBI on soil oribatid mite species assemblages associated to forage crops (mix of Timothy-grass and red clover). Abundance and species density of oribatids were affected by treatment, depth and the interaction of both variables. Abundance of oribatid mites was significantly lower in the oak TBI, showing a homogeneous vertical distribution in opposition to a decreasing with depth distribution under poplar TBI and conventional crops. Species density was significantly higher in the conventional crop, showing again significant differences in depth that were not present in both TBI treatments. Distance to tree did not affect mite abundance nor species density. TBI increased oribatid richness (obtained by sample-based rarefaction and extrapolation) only in the presence of oaks. The distribution of oribatids was strongly associated to tree fine root biomass and stress the importance of underground organic resources for the oribatid fauna and their ecological functions. If increasing drought associated with climate change desiccates superficial levels of agro-ecosystem soils, deeper sources of organic resources, such as tree roots, should become crucial in the maintenance of diverse microarthropod communities. This work benefitted from funds from the Fonds vert, part of the Plan d’action 2006–2012 sur les changements climatiques of the government of Québec. Lea Bouttier kindly provided her data on root biomass. We would like to thank Luana Graham-Sauvé for her help during the fieldwork and Émilie Rivest and Evick Mestre for their work during the extraction and identification of oribatids. EDM was partially supported by the BE-DGR 2011 program of the Catalonian Agency for Management of University and Research Grants, the MONTES-Consolider project (CSD2008-00040), funded by the Spanish Ministry of Economy and Competitiveness, and the NEWFORESTS project (612645), from the European 7FP.